There are only five Rounded Trominoes with a toal area of 15 squares but a 3x5 rectangle or a 3x5 paralelogram aren't possible to cover. At least a trapezium, already show by Miroslav Vicher, and figures with two or one axis of symmetry or rotational symmetry can be constructed. 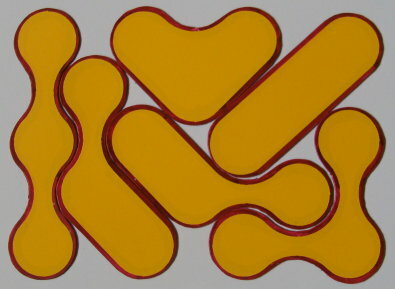 The symmetry only refers to the cells or rounded squares not to the bridges. The six one-sided pieces allow for a symmetric hexagon and a jagged 4x3 rectangle. To get real pieces I first printed the picture on magnetic foil und tried to cut them out with a cutting plotter. Unfortunately I couldn't adjust the foil to match the printed outline with the path of the cutter. This method failed. Therefore I cut the pieces once from magnetc foil and once from adhesive film with a small inset. Then I put the adhesive part on the magnetic foil. Now the pieces can easily be fixed on iron background. We get some more pieces, if we polarize the squares parallel or diagonal to the grid. We can also switch to rectangular respectively rhombic cells, which is essentially the same. Each set has eight members but the construction with these sets are different. Here are the sets. It isn't possible to construct 8x3 or 6x4 rectangles with these sets but two other symmetric constructions are shown. The set of one-sided polarized pieces contains 12 member and a lot of symmetric constructions are possible. In case of the one-sided pieces the kind of polarization doesn't matter.